Editor’s note: This is a topic we discussed last week, including the map. “A deep demographic and political divide revealed itself in America during this year’s presidential election, with ethnically diverse urban areas largely backing Hillary Clinton and mostly white rural areas largely backing Donald Trump,” as the Sacramento Bee is reporting. “That same divide can be found in California, even as Clinton won the state by millions of votes. 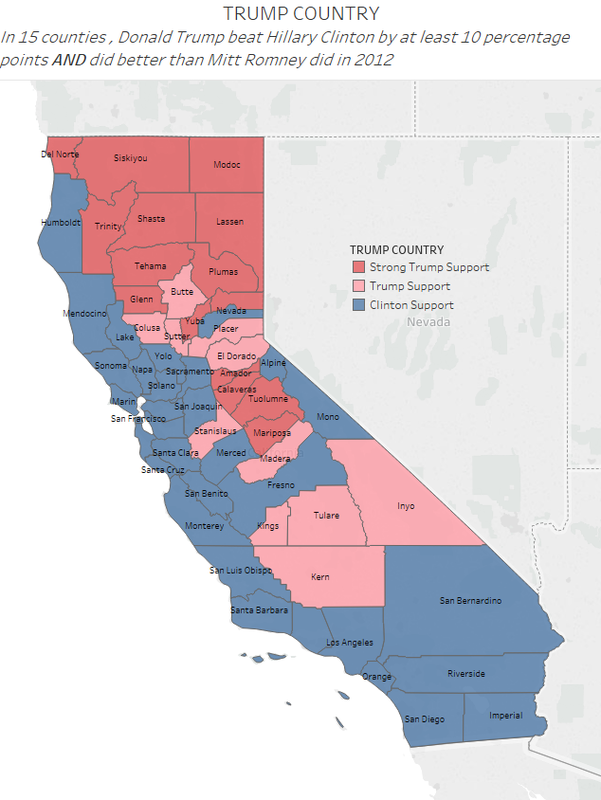 “Trump beat Clinton in 26 California counties, mostly in the Central Valley and the mountains of Northern California, places that long have been bastions of conservatism. But in 15 California counties, Trump won really big – beating Clinton by at least 10 percentage points and earning a higher share of votes than Mitt Romney did in 2012. “These 15 counties have much in common with one other – but have sharp differences when compared to the rest of California. “Eleven of the 15 are located in Northern California, mostly in the “State of Jefferson,” the largely rural expanse between Sacramento and Oregon where activists have been pushing to form their own state. The remaining four are in California’s Gold Country region, in the western Sierra foothills southeast of Sacramento. “With 650,000 residents, these 15 counties make up just 2 percent of the state’s population, but almost 25 percent of its land area. “Among the characteristics they share: They are collectively losing population, even as the rest of the state grows. In terms of ethnicity, they remain relatively homogenous – about 75 percent white – as the rest of the state grows more diverse. “Their residents are more likely to have served in the military: 12 percent of adults are veterans, double the rate elsewhere in California. About 18 percent of adults have bachelor’s degrees, compared to 31 percent elsewhere. About 44 percent are over age 50, compared to 34 percent elsewhere. Gun sale rates in these counties were more than double the rate in the rest of the state. “These 15 counties are among the few places in California where housing remains affordable, with median home prices below the statewide average. Even so, economic and health conditions in many cases have reached a crisis point. Suicide rates are double the rates elsewhere in the state. So are accidental drug overdose rates. Incomes are relatively low, with a third of households making less than $30,000 a year. “And their children are often on their way out. Net migration of 15- to 30-year-olds in these counties was negative 8 percent between 2000 and 2010, as many more youth left than arrived. “With a scarcity of residents, they have little political power to focus the state’s attention on their problems. “These 15 ‘Trump Country’ counties, though, should not be shorthanded simply as “rural California,” because the state’s rural counties are not politically or demographically uniform. “Large swaths of the state’s southern rural expanse – counties such as Imperial and San Benito that are heavily Latino – rejected Trump. So did several counties with demographics similar to the 15 counties in “Trump Country,” places such as Nevada County, Humboldt County, Mendocino County and Alpine County. Jeff, you’ve long written about the “purplish” nature of Nevada County. Local politics may be R, but it looks like the trend toward higher offices in NC continues to be toward the D.
The LaMalfa-Reed race is razor thin, and Clinton is leading Trump, and Harris is beating Sanchez, and McClintock in losing handily — all in NC. True that Dahle and Gaines are winning. Dahle has long had bipartisan support, though.